The Death of Captain America | Blah! Just over a year ago, in March 2007, I posted about the death of Captain America, about how there was so much negative reaction at a story that many people hadn’t read yet, that I thought as long as the story was good, that is all that matters. Though, I also hadn’t read it at the time. Well, I finally got the trade paperback “The Death of the Dream,” which collects the issues of Captain America in which he is killed and the issues just following. 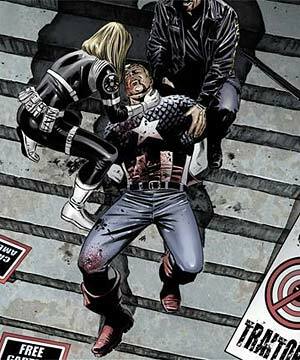 The first issue is about the assassination of Cap, while the rest follow the supporting cast and their reaction to Cap’s death. The cast includes Sharon Carter, Cap’s girlfriend; Tony Stark (aka Iron Man); Bucky (Cap’s WWII sidekick); and the Falcon, one of Cap’s most trusted partners. It also follows Cap’s long time nemesis, the Red Skull, and his plans for destroying America. As I said, I hadn’t read the comic when I first posted. I just said that, as long as the story is good, that should be what matters. And, Ed Brubaker and Steve Epting do indeed deliver on a good story. The Red Skull and his crew have infiltrated America’s most powerful spy organization, S.H.I.E.L.D., to such a degree that the S.H.I.E.L.D. director, Tony Stark, has no idea who to trust. And the Red Skull’s daughter, Sin, leads a team of terrorists/assassins that are shocking in their brutality. All of this goes on while the main characters cope with Cap’s death and how to go on with their lives. Their rage distracts them from the Skull’s plans, as they look in other places for meaning and vengence. And when they do start to confront the Skull, they do so recklessly, with the expected bad results. I’ve not been a huge Captain America fan, though I have followed a few arcs in the past. Cap is best, to me, when he is a street level hero, fighting as a soldier, against the hidden forces that try to undermine the society around him, rather than a cosmic hero fighting bigger-than-life supervillains. And that is precisely the level of characterization we get here. This trade paperback collects a set of issues in the middle of Brubaker and Epting’s run, after they’ve reintroduced Bucky to the Marvel Universe and just as they begin exploring life post-Cap. I enjoyed this collection enough that I will definitely seek out the rest of their run (as fast as my pocketbook allows me to). Nice preview and recap. I, too, used to read comic books, though I’ve never been able to really afford them. I picked up The Death of Superman. This sounds better, so though I’ve never been a big Cap fan, maybe I’ll pick it up. Thanks for the info.